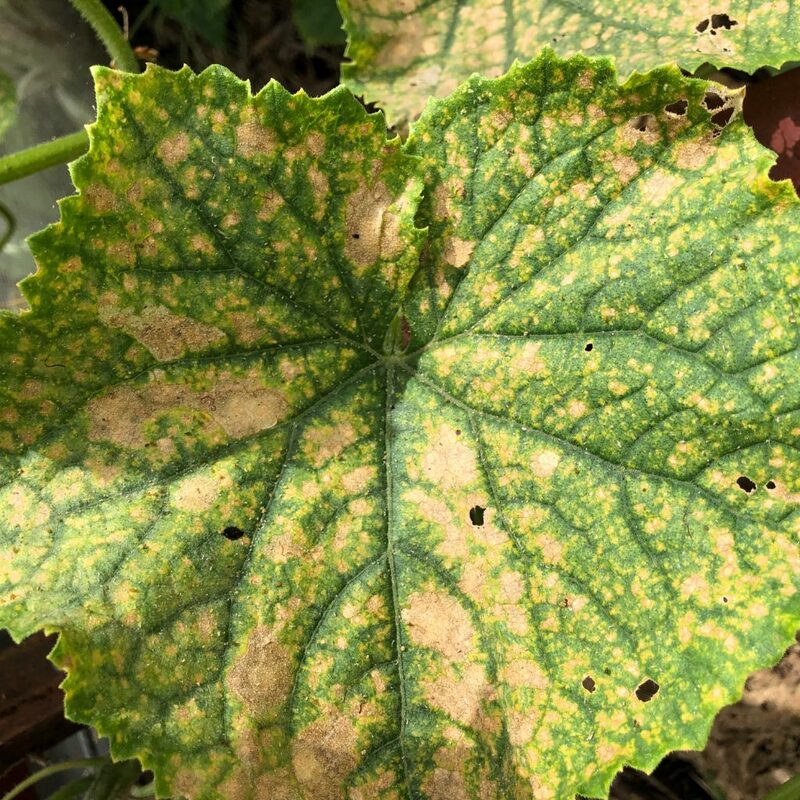 Powdery Mildew is so common in our summer gardens. 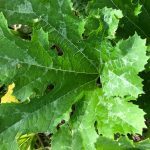 It’s a real pest for gardeners, appearing as fine dustings of ‘powderiness’ on the surface of leaves on plants that look otherwise healthy. It leads to rapid decline and often collapse and a premature death of the plant. 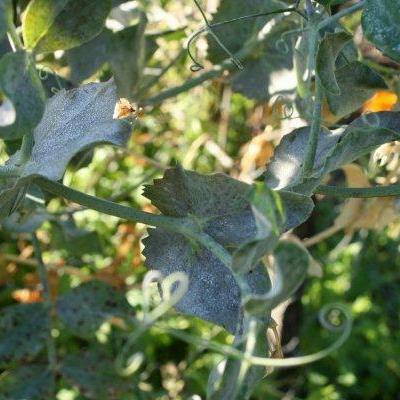 But before the worst happens, let’s have a quick look at powdery mildew and what you can do as an organic gardener to strengthen your plant’s defences and at least get a good crop of flowers or fruit. Powdery Mildew is a fungal disease. 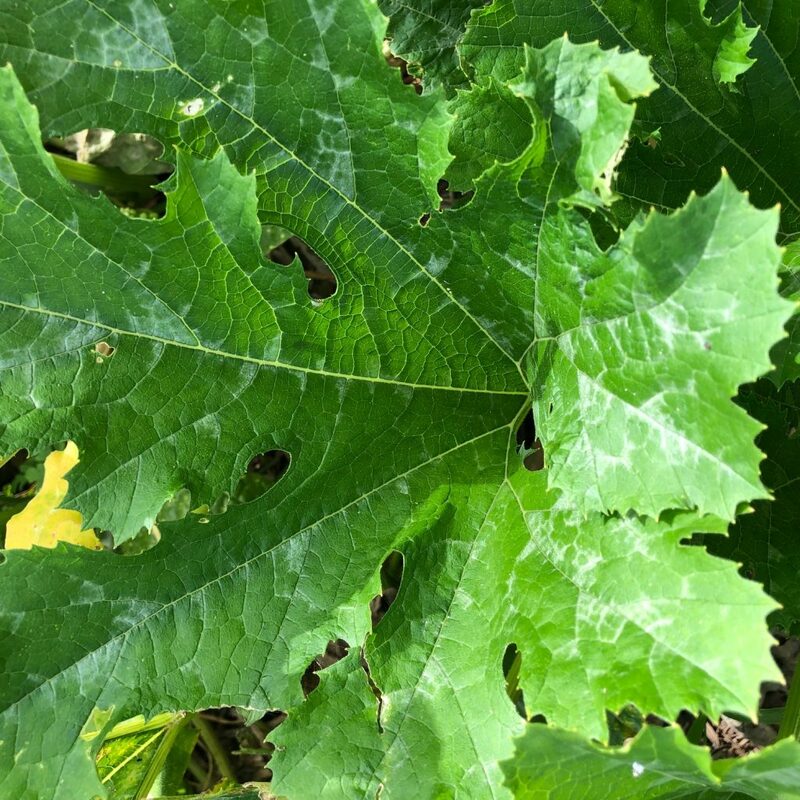 Research indicates that different fungi are the causative agents on different plants, so grapes, cucumbers and roses will each have a different species of fungi causing the issue. However, general treatments I detail below will have a positive effect for most plants. 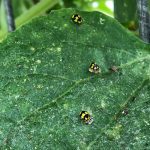 Here, I’ve outlined some step by step organic and biodynamic treatments, including how to go about prevention of severe infestations. Start by creating healthy soil. That means, pH , moisture, food, and air as well as fertility…Aim for a pH of 6.4 as the plant and the soil microbes are most receptive to uptake of nutrients. In our garden the soil tends towards acidic which is ideal for the growth of disease and pests. We also have a calcium and magnesium imbalance which we are constantly addressing (It’s not a short term one off fix), and fertility is low but on the improve, so we are working at every planting, towards supporting the development of a healthy soil biome, teeming with supportive microbes. Instant Humus to the soil is an absolute must at planting time, and has made the biggest single difference to plant health on our garden. I recommend it for all gardens everywhere and you can order yours through me for whatever size garden you have. Before you add plants, add some organic fertiliser. Adding both compost and worm castings or liquid as well as fertiliser, increases beneficial organisms that out-compete the fungi. I use a locally available product and find that either pelletised or finer organic manure and seaweed based fertilisers are good for my garden. The pellets take longer to break down and are in this way, slower release. Picture at right is a cucumber leaf treated with an oil spray. 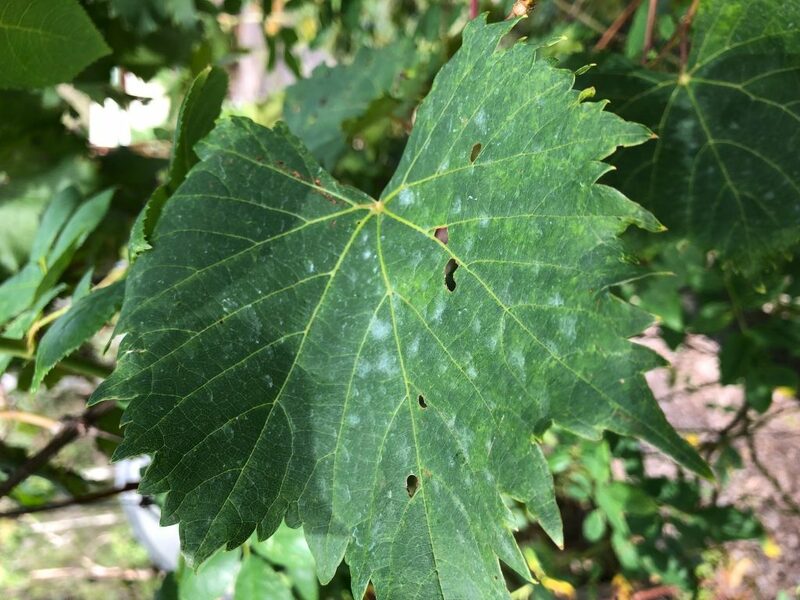 However, high daytime temperatures caused leaf burn. Apply sprays in the cool of the evening. When growing from seed, save or choose seed from plants that are healthy and disease free. The fungal spores can be transmitted on seeds. Keep your plants growing strongly. Water often enough so the soil remains moist to touch. Fertilise with foliar feeds weekly to fortnightly, using a product that contains both fish and seaweed. The first sign of powdery mildew is when you see the fungus eating ladybirds on your plants. 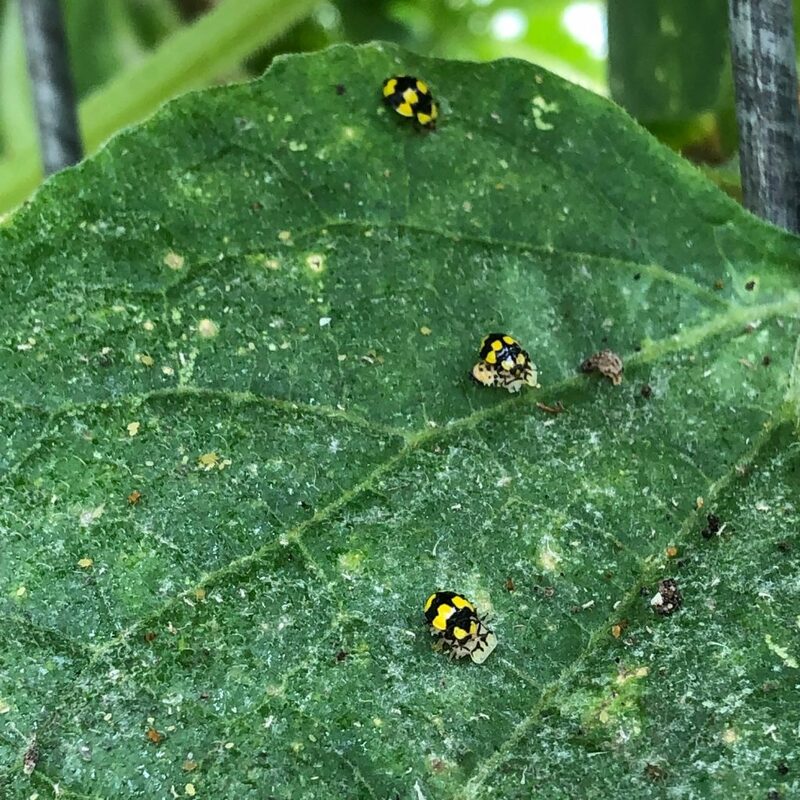 (You’ll see these little black and yellow ladybirds on a leaf in the picture) Start the treatment sprays now while the plant is still in the early phases of fungal infestation. Start with level 1 sprays. If you need more , move onto the next level of treatment. Level 2. Wettable sulphur is the next level of treatment. Agricultural sulphur is not suitable. You can use dusting sulphur, but I find getting under the leaves with sprays makes them more effective and it’s hard to dust upside down. Level 3 . Copper oxychloride spray. This big gun will knock out all but the most entrenched infection. However applying copper regularly to plants will also cause it to build up in the soil to a toxic level, so use as a last resort. It also kills beneficial fungi!! The final pic is a healthy zucchini leaf. The silvery patterning is normal for healthy zucchini leaves. Level 4 Finally, if you find all the plants completely white with powdery mildew, remove the plants, solarise in a plastic bag in the sun to kill the fungus then throw the gooey mess into a hot compost heap to finish it off. To prevent spread of disease, wash hands after touching infected material and clean tools, trellises and stakes with hot soapy water and methylated spirits.